Democrat-controlled House Committees put pressure on Donald Trump on three fronts, seeking his tax returns and authorizing subpoenas for full disclosure of the Trump-Russia report and for Trump’s financial records. On Wednesday the House Judiciary Committee voted 24-17 to demand unredacted copies of the Mueller Report from Attorney General William Barr, criticized for trying to cover up the findings in a four-page letter protecting Trump. Barr missed an April 2 deadline, saying he would send the report in mid-April but only with redactions. We are going to work with the attorney general for a short period of time, in the hopes that he will reveal to us the entire Mueller report and all the underlying materials. In very short order we’ll issue the subpoenas if that doesn’t work out. Before the Mueller report was submitted to Barr, the House voted 420-0 on a non-binding resolution for release of the full text, but Trump friend Sen. Lindsey Graham blocked a vote on the resolution in the Senate. Soon after Barr’s letter, Senate Majority Leader Mitch McConnell blocked an attempt at a vote on the report’s publication. The chairman of the House Ways and Means Committee asked the Internal Revenue Service for Trump’s personal and business tax returns from 2013 to 2018, setting a deadline of April 10. Trump immediately said he would not comply. He has refused as a candidate and then in the White House to release the returns, breaking a practice observed by every President since Richard Nixon. Trump has given the excuse that he is being audited, even though experts say an audit does not prevent release. Trump has told White House advisers that he will not hand over tax returns to Congress and will fight an order in the Supreme Court, hoping to stall any compliance until after the 2020 election. 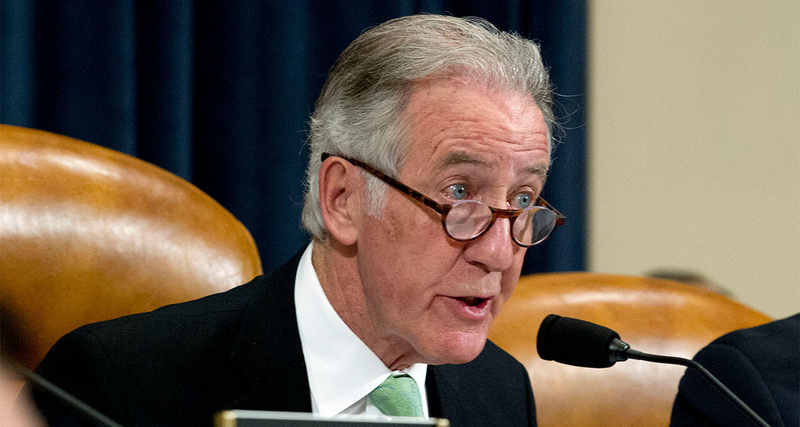 The request by Ways and Means chair Richard Neal also seeks the records of entities such as the Donald J. Trump Revocable Trust, an umbrella firm that controls more than 100 other businesses, including his Mar-a-Lago resort in Florida and Trump’s homes, hotels, golf clubs, and properties in Scotland. A New York Times investigation established last autumn that Trump benefited from dubious schemes for tax avoidance and deception after receiving at least $413 million, in today’s economy, from his father’s real estate holdings. House Oversight Chairman Elijah Cummings said Wednesday that Trump’s accounting firm Mazars USA will provide financial documents under subpoena. The accounting firm told us that they will respond, and they just want a subpoena. They have told us that they will provide the information pretty much when they have a subpoena. And we’ll get them a subpoena. The committee has been given three years of financial statements, prepared by Mazars, by Trump’s long-time lawyer and fixer Michael Cohen. In February, Cohen told the committee in open session that Trump had inflated or deflated his wealth over tax and insurance case, raising the possibility of fraud. TrumpWatch, Day 798: Trump Inflated Supposed Worth — Is This Tax and Insurance Fraud? Cummings’ letter to Mazars raised concerns about the calculation of Trump’s net worth, the omission of real estate assets and debts in Chicago and Las Vegas, and the valuation of “real estate licensing developments”.